Effects of FGF21 on body and tissue weights. 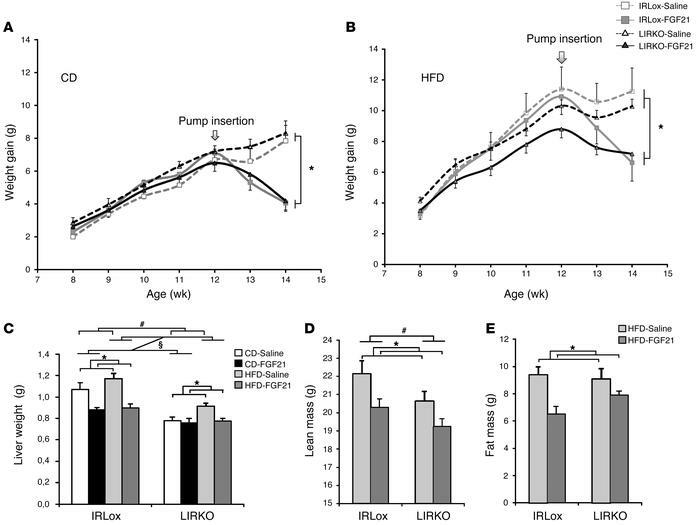 Control and LIRKO mice were fed either a CD or an HFD for 7 weeks and were treated with saline or FGF21 (1 mg/kg/day) delivered s.c. by osmotic pump during the last 2 weeks of the diet. Body weight was measured once a week, and tissue weights were determined on day 14 after insertion of the pump. (A and B) Body weight gain of animals on a CD (A) or an HFD (B). Gray lines with squares represent control mice, black lines with triangles represent LIRKO mice, dashed lines represent saline-treated mice, and solid lines represent FGF21-treated mice. (C) Liver weight. White bars represent saline-treated mice on a CD, black bars represent FGF21-treated mice on a CD, light gray bars represent saline-treated mice on an HFD, and dark gray bars represent FGF21-treated mice on an HFD. (D and E) Lean mass (D) and fat mass (E) from DXA analysis. Light gray bars represent saline-treated mice on an HFD, and dark gray bars represent FGF21-treated mice on an HFD. Data represent the means ± SEM. P values were calculated using 2- or 3-way ANOVA. #P < 0.05 between genotypes; §P < 0.05 between diets; *P < 0.05 with FGF21 treatment. n = 5–12 animals per group.